You won’t believe these quick & easy Dark Chocolate Peanut Butter Apples are a healthy snack or dessert! 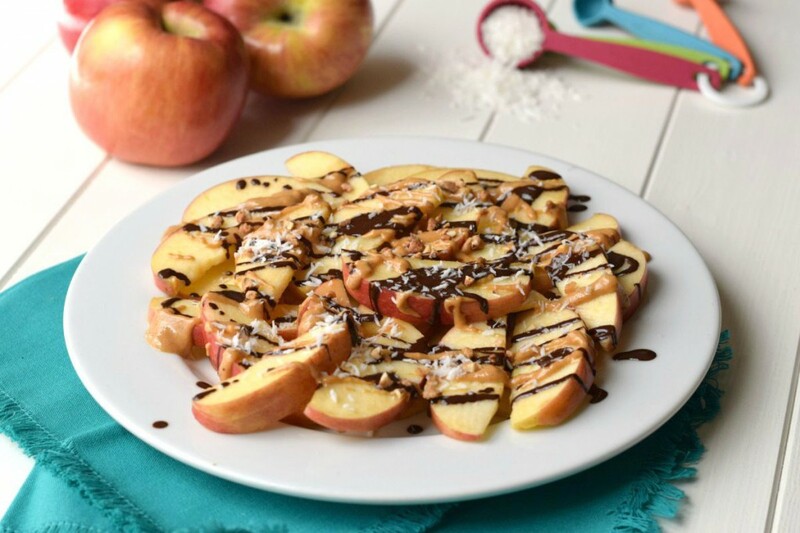 Apples, dark chocolate, peanut butter, coconut, and almonds are the perfect flavor combo! I was lucky enough to get an early copy of the latest cookbook from the amazing ladies at www.OurBestBites.com – 400 Calories or Less with Our Best Bites!! You guys, this cookbook is awesome!! I’ve already tried 5 of the recipes and my family has LOVED every single one! This yummy recipe is a lot like my Caramel Pecan Apple Nachos, but the nice thing about this one is that it takes literally 5 minutes to throw together. No real cooking, just a few seconds to heat the chocolate and peanut butter in the microwave. YUM! Run try these! I just know you and your family will love them just as much as we do! You won't believe these quick & easy Dark Chocolate Peanut Butter Apples are a healthy snack or dessert! 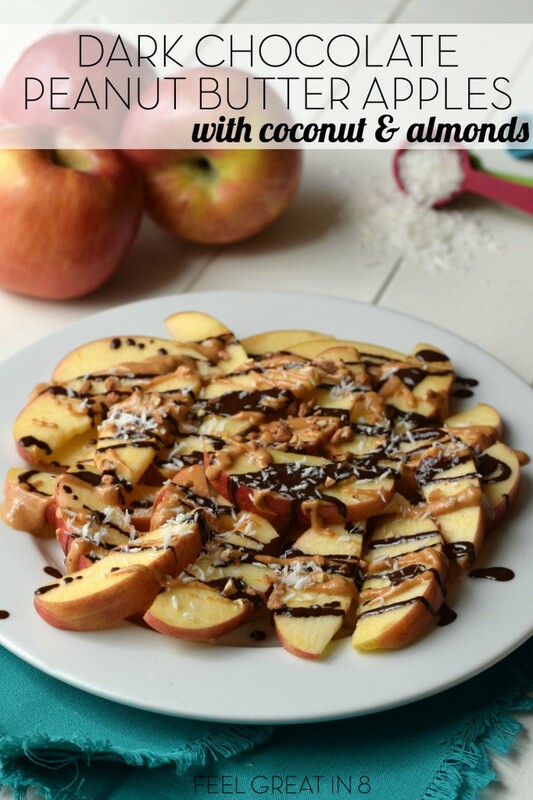 Apples, dark chocolate, peanut butter, coconut, and almonds are the perfect flavor combo! Core the apple and slice into ¼ inch slices. Arrange in a single layer on a plate. Put chocolate and coconut oil in a small microwave-safe bowl and microwave 15-20 seconds at a time, until melted and smooth. The coconut oil is optional, depending on the kind of chocolate use. I just chopped up a square of dark chocolate and melted it without the coconut oil and it still worked great. In a separate bowl, melt the peanut butter for 20-30 seconds, until soft and you're able to drizzle it with a spoon. 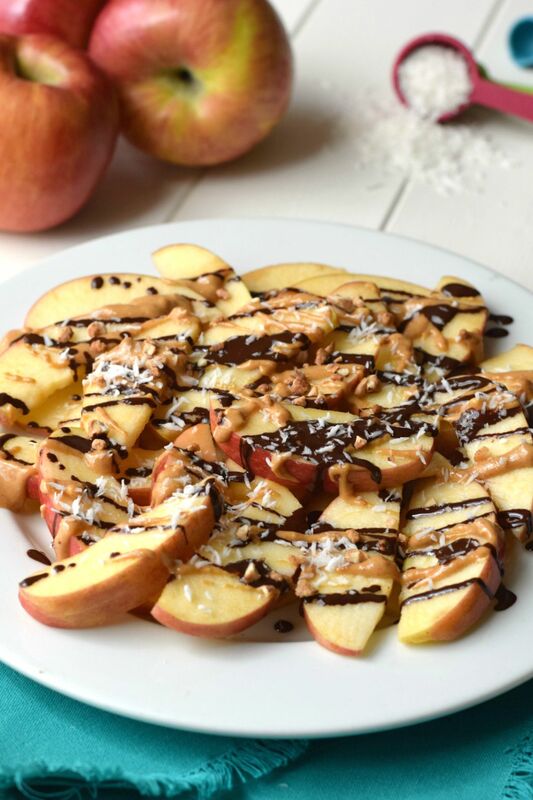 Drizzle chocolate and peanut butter over the apples. Sprinkle with coconut and almonds. ENJOY! Recipe slightly adapted from the awesome cookbook 400 Calories or Less With Our Best Bites by Sara Wells & Kate Jones. Actual nutrition info may vary based on exact ingredients used. 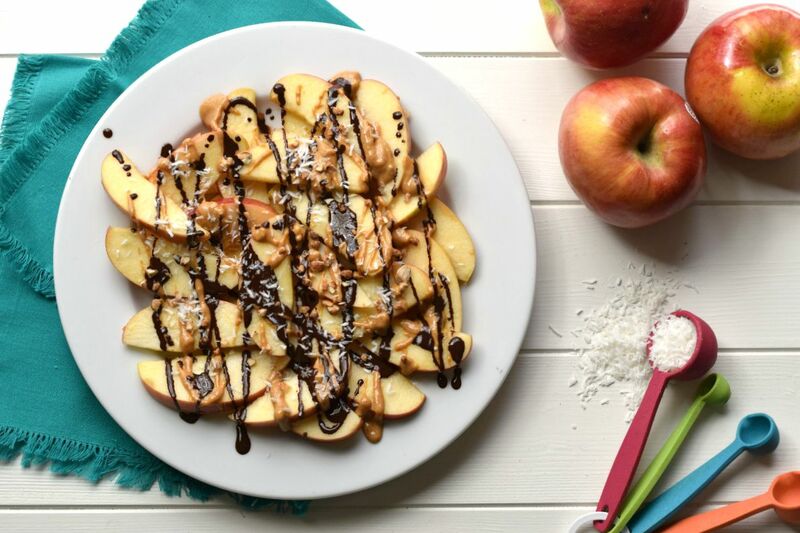 Find this recipe on MyFitnessPal as FG8 Dark Chocolate Peanut Butter Apples. 1. Natural Peanut Butter: Switching to natural peanut butter was one of the easiest healthy changes for my family to make. Yes, it takes a few minutes to stir back in the oils when you first open the jar, but the flavor is just as delicious without all the added sugar. Next time we run out I’m going to try this Earth Balance brand with flax. 2. Green & Black’s Organic Dark Chocolate: There are lots of great brands of dark chocolate, but this organic brand is one of my favorites. Just make sure you look for 70% cocoa or higher, so you don’t miss out on all the great health benefits. 3. Unsweetened Shredded Coconut: Dried coconut that isn’t sweetened can be tricky to find. Look for this Bob’s Red Mill brand, or look in the bulk bins at your local grocery store. It is so yummy, even without all that added sugar. 4. 400 Calories or Less with Our Best Bites: Absolutely everything I’ve tried in this cookbook is delicious!! It is full of simple, healthy, light, fresh, delicious recipes. I’d say it is a much have in any healthy kitchen. Looking for more healthy real food snack recipes? * Some links are affiliates. The cost to you is the same, but I get a small commission. I only recommend products I truly believe in.